This was a fun card to make. I was sitting along Fall River in Central Oregon on a very warm day last weekend and created this card. Distress techniques lend themselves well to dusty, outdoor locations! I created the base background with a Memory Box stencil and Distress Ink and then stamped and cut out the leaves, splattering them with water and Distress Ink. I used the same stamps on watercolor pap er with less ink and more water to give indications of leaves and more splatters. I attached the leaf cut-outs on top of all of the layers and then stamped the sentiment on a small scrap colored with the same ink colors. All elements are edged with ink to finish them. I’m trying to make some Autumn cards for Operation Write Home before the deadline. Thanks for visiting. This entry was posted on Thursday, July 31st, 2014 at 4:51 pm	and tagged with cardmaking, distress techniques, fred b. mullett, Hero Arts, leaves, memory box, printworks, stamping, stencils, watercolor and posted in Autumn, Distress Techniques, OWH, Thank You. You can follow any responses to this entry through the RSS 2.0 feed. « You’re the cat’s meow! Hi Yvonne. This is gorgeous. I love your stenciled background – so pretty. And the way you’ve stamped “lesser” versions of the leaves with splatters for your background and then mounted the full-colored leaves on top – so creative!! Thanks so much for joining us at ATS&M. 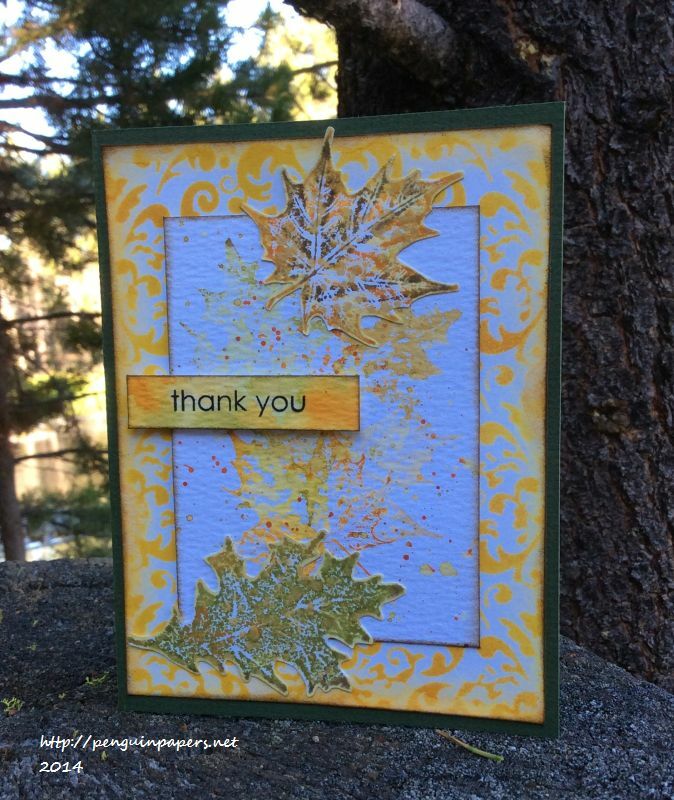 Yvonne, I’m a leaf “addict” :)…love this gorgeous card…beautifully designed! So happy you could join us at ATSM!